Dr. Mick Foley, together with Bill van Nierop, talks about Long Kayak for Lungs 2018, an effort to raise awareness of Idiopathic Pulmonary Fibrosis (IPF). IPF is a type of rare chronic lung disease that shows a progressive decline in lung health and function. Bill was diagnosed with IPF in 2015, so he understands the challenges faced by those impacted by lung disease. 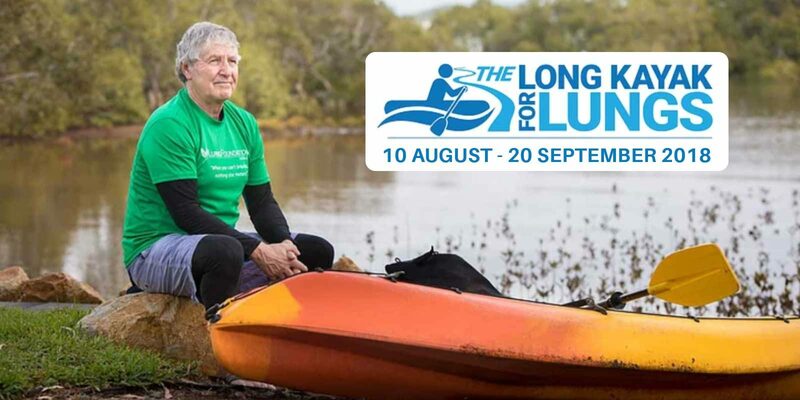 Following his successful Long Walk for Lungs in 2017, Bill pushes to support Lung Foundation Australia with a new challenge for 2018 – The Long Kayak for Lungs, a 42-day charity kayak paddling 2,200kms from Albury NSW to Murray Mouth in South Australia. Wayne Bucklar: You’re listening to Health Professional Radio. My guests today join me to talk about something that each of them are passionate about. Bill van Nierop from the Lung Foundation Australia is joining us to talk about the Long Kayak for Lungs and Mick Foley, founding scientist with AdAlta is here to talk to us about why the sponsorship relation and what it is that AdAlta does that ties in. First of all, Mick welcome to the program. Mick Foley: Thank you very much, it’s nice to be here. Bill van Nierop: Thank you. Wayne: Now first of all, Mick tell us what AdAlta does and why you have an interest in idiopathic pulmonary fibrosis. Mick: So AdAlta is a bio-technology company based in Melbourne and it was spun off from a Cooperative Research Centre and we have a technology which is really singled in antibodies. We develop them from the shark and these antibodies are much smaller than normal traditional antibodies and the target that we’re looking at is actually a very important target in pulmonary fibrosis so we’ve done a lot of work a lot for preclinical data showing that the antibody that we have was able to block the function of this particular molecular target which is very important in pulmonary fibrosis. So the data that we have seems to indicate that if we block this target using our antibody, we were able to prevent the progression of pulmonary fibrosis at least in most models and what we’re trying to do now is to commercialize this and basically try and do a human trial. Wayne: It’s always a long journey for new pharmaceuticals. You say this is working in test tubes and mouse model, what has to happen before the human trials can get underway? Mick: So we need to manufacture this which does take some time and quite a bit of money and we need to do some basic toxicology studies to show that it’s not going to be consequently we put this into people. But given that it’s a biological molecule, the chances of toxicity are much less than if it was a small chemical for example. So those two major things before we test it in humans and we’re really trying to do that as fast as possible but like you say, it does take a bit of time. Wayne: And Bill in Australia generally do you find there’s a lot of support for this sort of research or do you think you’ll get driven overseas to get research dollars? Bill: There’s lack of research in Australia because recent surveys would suggest and confirm that in Australia we look much more harshly at lung disease than they do overseas. The lack of community interest in it and the impact of that is that you just can’t get research funding. Wayne: How did you get interested in idiopathic pulmonary fibrosis? Bill: I have it. I was diagnosed in 2015 with idiopathic pulmonary fibrosis and it did not take long to recognize the stigma attached to it. Wayne: And what is that stigma? Bill: The stigma is that it’s basically a smoker’s disease so if you tell somebody you have a coronary issue or a heart attack or got whatever, you are more than likely to get quite an empathetic hearing and caring etc. When I tell people I got a lung disease, the answer is “You’re a smoker then.” So there’s a lot of people out there sitting with a lung disease actually have the true sense of guilt and shame. Wayne: Yes and of course the anti-smoking campaigns have promoted that very heavily which is ironic really because all the people that have been smokers in their lifetime would say that they were heavily influenced by the advertising campaigns that portrayed it as the only cool way to be hip and with-it in the 1960s and 70s. Bill: Yeah, that’s true. I smoked in the 1970s. And with lung cancer particularly in women, either 30% have never smoked a cigarette but that’s irrelevant. At the end of the day, why do we talk about the cause when somebody already has it? Wayne: Yes, we tend to do that. That used to be the issue with other things like HIV and other illnesses, there was a stigma to the sin attached rather than a clinical focus on how do we deal with this. Now Bill I understand you’re off on a long kayak, is this a paddle for pleasure? Bill: If you have experience with lung disease you would realize that 42 days with 22,000 kilometers would not be a lot of pleasure. But it’s a wonderful river, I was born and raised on it – in and out of state in Australia. So the journey started will be magnificent and the challenge is around having 53% lung function. Wayne: So fill us in on where you’re going. Bill: We’re leaving in Murray River and finally it has moved up to 6 degrees which freezes me to no end. And we get to travel down to a place called Wellington in South Australia and will go through 20 odd kilometers on the way and it will take 42 days so that the plan. Wayne: And this is a fundraising venture and awareness raising venture? Bill: Yes, it is. Last year, I did a walk of some 700 kilometers over 15 days to start, to talk to the community to engage in a discussion about a disease that affects 15,000 Australians a year and gets ignored. And based on some of the success we raised $100,000 last year which is enormous in terms of fundraising but if you look at some of the more popular diseases, they raise millions. And lung diseases are the second-highest killers as a group in Australia. So yes we’d be out talking to the community groups and we’ve done several interviews and we’ve got some functions planned on the way where we will talk to groups along the way. Bill: Absolutely. There’s not a lot of people working on this. AdAlta have been a very keen supports of this, which I am wildly appreciative. Every dollar you get, you fight for because it’s lungs – trust me. Wayne: Yes. A friend of mine who is a lung surgeon once said “If lungs were on the outside, we wouldn’t have all these issues. No one would ever start smoking, no one would smoke again.” But because they’re on the inside, it’s not such an obvious feature. Bill: But the reality is, mine is idiopathic so the cause in unknown. We just need some empathy, I don’t like sympathy. Some empathy and understanding, we perpetuate it and we create a real mental issue for people out there with lung disease. I know a 42 year old woman, mother of two with an incurable lung cancer and she hasn’t told her family because basically she feels it was her fault. Wayne: Yes, there’s a lot of guilt involved. Now for anyone who’s interested Bill in finding out more, the website is www.longkayakforlungs.com.au. Is that the best way for people to get in touch with you? Wayne: And when you visit those websites folks if you happen to find a touch of guilt or a touch of compassion, put your hand on your wallets not your heart and help out in a very practical way. Bill it’s been lovely having a chat with you. And Mick for people who are interested in you and your shark based research adalta.com.au is the place where they can reach out to you? Mick: That’s right. You can go on the web and have a look at and we post regular things up there and I may I just say I think it’s amazing what Bill’s you’re doing to kayak on that river anyway it would be an amazing feat but to do it while living with pulmonary fibrosis is quite an incredible feat so I think as many people as possible should support them and be aware that this thing does exist and there are a few people and the Alfred Hospital for example has a great lung disease unit but like Bill said, it’s just not enough. There are a lot of them throughout Australia. Wayne: Yes and we don’t condemn people having knee replacements because they played football in their youth nor should we attribute lung disease to people’s behavior in their youth. So I wish you both well and particularly Bill on your endeavors. Good luck with all that paddling and as you say, it’s nice chilly waters so I’m glad it’s you going near it and not me. Bill: Thank you very much and thank you for the opportunity. Wayne: It’s been a pleasure having you both with me. If you just joined us on Health Professional Radio then you’ve just missed my chat with two guests I’ve been, talking with Bill van Nierop and we’ve been talking with him about the Long Kayak for Lungs a 42-day 2,200 kilometer charity kayak. Bill’s doing that, he’s doing the paddling and Bill is a sufferer of idiopathic pulmonary fibrosis (IPF) – a lung disease and so you can imagine the challenge involved. And we’ve been talking with one of his sponsors as well, Mick Foley. Mick is the founding scientist at AdAlta who is a research and a science company who have discovered some remarkable molecules in sharks which they’re developing for its ability to block fibrosis and treat fibrosis including idiopathic pulmonary fibrosis so both of them are fascinating guys. Now if you’d like to know more on our website we have a transcript of this interview we also have a podcast available on iTunes, YouTube and SoundCloud where you can download the whole interview again. So if you just joined us, you haven’t really missed it. You’ll just have to go looking for it but it’s there as a podcast for you to download at your leisure. You’re listening to Health Professional Radio, my name is Wayne Bucklar.